Cut through grease and stubborn grime with our powerful Gompels Degreaser Spray. Supplied in a multipack, these individual bottles feature easy-to-use spray nozzles and are sized for comfortable use. The un-fragranced and non-tainting formula has a multi-functional design that makes it ideal for a wide range of environments from catering through to offices. 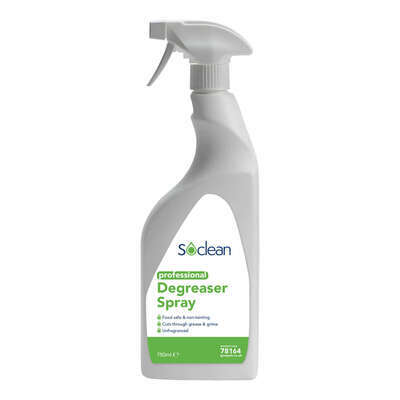 Use on floors, walls, kitchen equipment and cookers for a shiny surface that gleams from every angle, this degreaser spray is a must have for all areas involved in the production and cooking of food on a mass scale. For high-traffic, busy or larger businesses, consider instead our Gompels Heavy Duty Degreaser in a 2 x 5 litre packs.